Start your new day with Nueva Dia! Super fine, bright & crimpy! This young male is indeed the "total package" and has shown incredible presence in the pasture since the day he was born. Snowdrift just keeps getting better and we are having fun watching him grow and mature. This male has been amazing since the day he was born. He carries himself like no other young male I have ever seen; he is proud and confident. Along with perfect conformation, great bite and very nice substance of bone there is a winning personality. His fleece continues to improve as he matures and shows great character/structure as well as consistency. At the 2015 MOPACA show he received special recognition in the fleece show taking home "Best Handle" over all fleece show entries. Snowdrift is now breeding here at the farm and is open for outside breedings. This special female is a powerful foundation female with a sweet personality. She is still a strong producer even though she's hit mid-age. Her fiber is still soft and long enough to hand spin - I wear a knit hat made from her fiber just a couple years ago. Oh, did I say she had lasting fineness? Most definitely! At 10 years old Sophisticate still had an AFD less than 25 microns with an SD of 4.0 and CV of 16.3 and spin fineness of 23.1 microns (2014 histogram results). Sophisticate is average size and maintains good body score while pregnant and nursing. She's only been at my farm for a couple years. 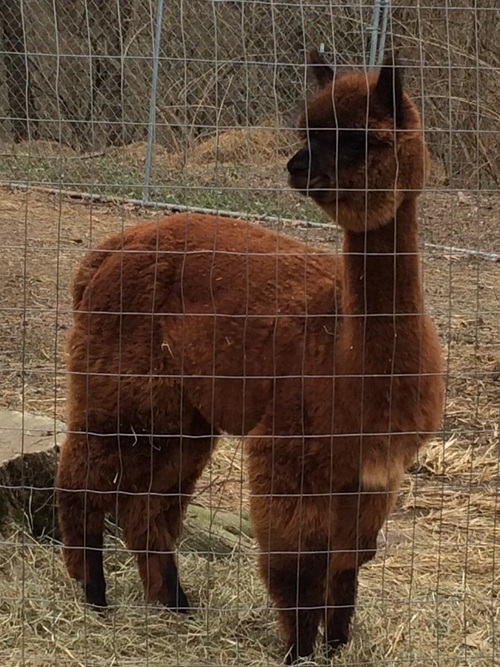 I'm excited to see the cria she is expecting this year. I would not be offering her for sale if I didn't already have her son and daughter in my small herd. Even at her age Sophisticate has a playful nature, she still pronks with the weanlings and is always the first of the adult females to kick up her heels when she sees us at feeding time. She is a proven dam with ample milk suppy and she is very attentive to her cria. She is bred to a beautiful white male with Snowmass bloodlines. 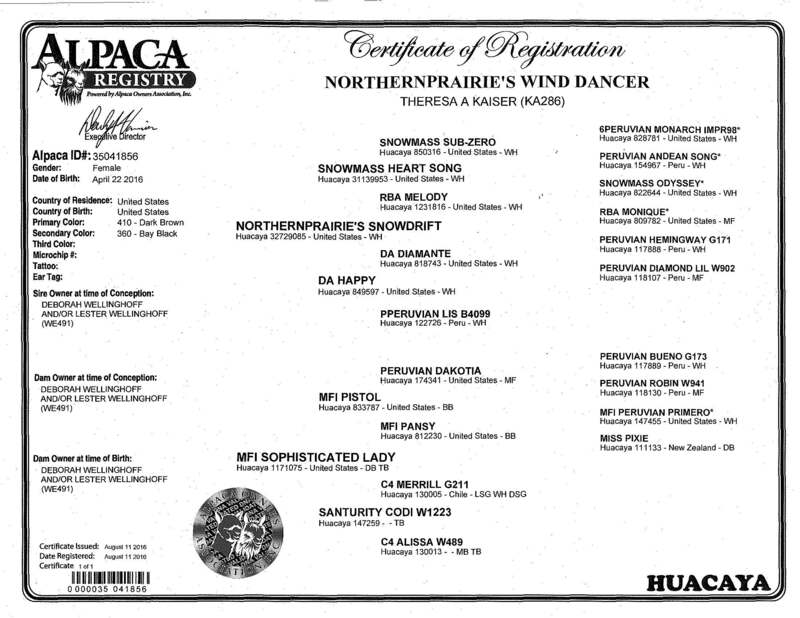 Her daughter Wind Dancer sired by another white Snowmass line is similar to her her dam in color (medium brown) and super fine (17.9 micron at 11 months). I expect the same outcome, with hopefully more density as well. Don't wait too long- I may decide to keep her! It's not too late to buy her and move her to your farm to get settled in before summer. 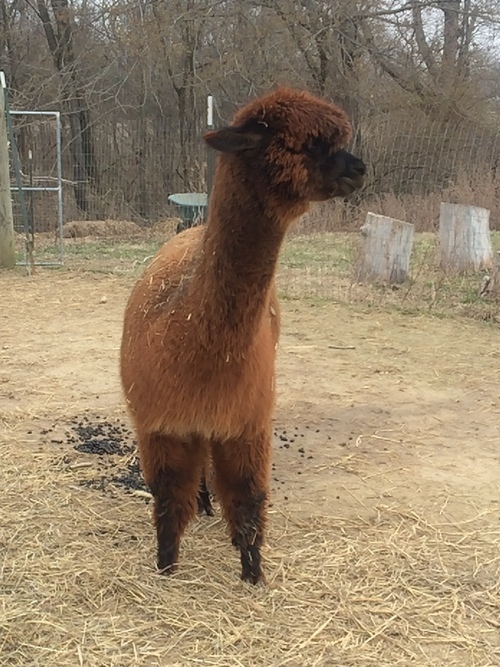 Cria is due in early August. March 2019 - Oro's first offspring are due to hit the ground in a few months and we can't wait. 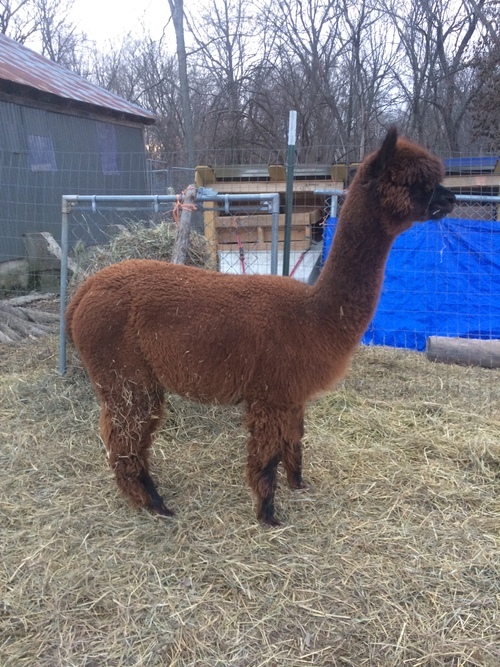 He is still getting blue ribbons and he is still maturing - his frame and fleece are really coming into their own as he develops and we are super glad we have him. This male will definitely be getting more work this year! This well grown young female has been hidden away on our farm. She absolutely loves visitors! She approaches and stands freely next to them to get hugs. And then they touch her fiber and remark at how soft she is - and that she is! Wind Dancer joined our farm along with her dam in 2016. She is growing nicely with a soft, fine blanket and solid conformation. Her fiber is oh, so soft and fine with good density and finely bundled crimp. Her 2017 Yocom McColl testing results were exciting! 17.6 micron for a medium brown weanling! Wow! SD 4.2, CV 23.8, and only 1.3% over 30 micron. I think I've found a perfect match for her "first date" and she'll be visiting him later this spring. Wind Dancer sells as a bred maiden female. We are flexible - just ask! In general, 25% down, with up to 24 monthly payments, 1% over prime; no interest charged if paid in full during first 120 days. Full insurance coverage required for animal to leave our farm. 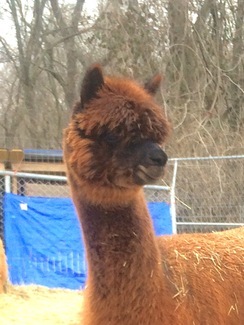 All cria produced from females being purchased will be co-owned between seller and buyer until female is paid in full. 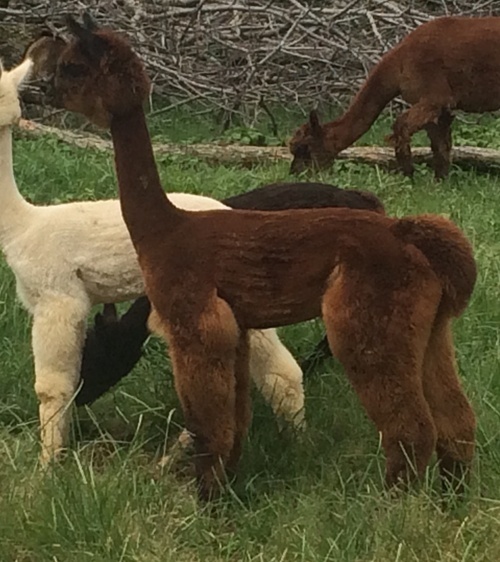 60 days agistment included free of charge, or until cria is weaned if buying a female and not her cria at side. For individual purchases over $2500, 10% discount for cash sales paid in 30 days. We will transport animal to your farm if within 150 miles.